In a couple of recent posts I shared photos of plants I identified as Aporocactus. That, of course, is incorrect. 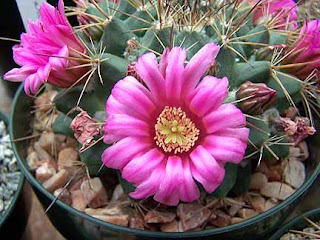 The Aporocactus genus is comprised of 5 species (and is now combined by some into the genus Disocactus). Instead, these should have been labeled Aporophyllum - or even more accurately X Aporophylum. These are intergeneric hybrids. I apologize for the mistake. Unfortunately, it is a common error and all sorts of names are thrown about. And now it's time for the Rebutias, in this case Rebutia perplexa. Always have liked these plants. It's Aporocactus time in the greenhouse. This one is 'Beauty'. Believe me when I tell you I'm not overly fond of Aporocacti; most of the year they're just plain ugly. But they get their reprieve every year when these flowers come along! 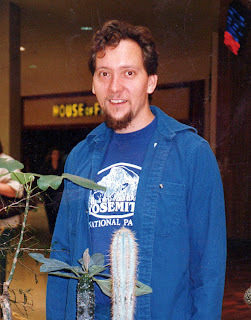 We just learned on Sunday that Steve Nelson, long-time member of the Oregon Cactus and Succulent Society and a very well informed succulentophile, died this past week. He will be missed by a lot of cactus and succulent enthusiasts. A memorial is being held at the People's Food Co-op in SE Portland this Saturday, from 1-3 p.m. Follow the title link for more information. This picture is of him as the show chair of the OCSS Show & Sale in 1987. A beautiful unidentified Mammillaria hiding away on one of the back tables. We had a pleasant little visitor in the main greenhouse yesterday. We've had a lot of hummingbirds in the area lately and this one found it's way into the greenhouse but then couldn't find a way out. With a little coaxing, it finally got down low enough to find the door and exit. Another beauty at this time of year is Sinningia (syn. Reichsteineria) leucotricha. Also know as "Brazilian Edelweiss", this display is as consistent and dependable as you get in the plant kingdom. First the flowers and then the leaves, which keep getting larger and more impressive throughout the Summer. Plus, they have interesting tubers which can be raised above the ground for added interest. Who can resist? Here it is; back again. Only this time the flowers are beginning to open. And the flowers are indeed fantastic. Lynn-Marie was working in the greenhouses today and couldn't resist taking a few photos. The Echeveria prolificas are especially colorful this time of year. This is one of our old Fockea edulis plants. Another Haworthia. This time it's Haworthia magnifica var. splendens from a different location (GM452). We're growing these on and they aren't available yet. In the meantime, we're enjoying watching them grow and get their adult characteristics.